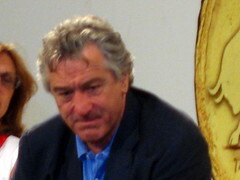 In a master class at the 2010 Taormina Film Festival, the cinema "ueber"-icon Robert De Niro talks about his work as a Director, his recent successes in comedies and how working with Michael Mann turned him into a potential bank robber. We just saw the movie The Good Shepherd which you directed - what attracted you to this story about the CIA? Robert De Niro: Intelligence - any intelligence service - is interesting to me. That whole world is fascinating. It's fascinating stuff - great stuff for a movie. How could the story develop? What would be the sequel? 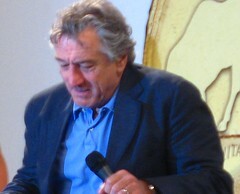 Robert De Niro: The first sequel would be from 61 to 89  covering the building of the wall to the falling of the wall. That's what the intention is. The next one if I ever did it would be to the present. Mainstream American cinema is not providing the same pleasures as when I was young. Enteraining and smart cinema seems to go away. Do you feel that you arrivedat exactly the right moment to do your career? 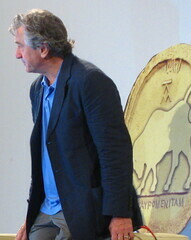 Robert De Niro: There are more independent films being made than when I started out. There was de palma and others but today it seems there's a whole lot more. Now there is a swing to spectacle cartoon type situations - they are all fine, but I don't know how I fit in that kind of stuff. Then again, you do see more movies that are made independantly than in the 60s and 70s. You produced over forty films - How do you select the film you will produce? Robert De Niro: We do all kinds of things - personally the kind of movies that I like are the ones that have a real story characters and so on. Making movies is so hard - making The Good Shepherd was such an uphill struggle because it was a big budget. So you have to get the actors that can support the movie from a business perspective. I don't know if in the end I will be able to do second part. Getting the script, right, getting the actors then getting the money - it's a long haul. Now that you have done all three things that an actor can do  acting, directing, producing - which gives you the most pleasure? Robert De Niro: Acting and then directing. When you're directing you have to do so many things at the same time  that takes a lot more of you . So I have to really want to direct the movies. It takes years to do all these things. As an actor you can prepare but you still have days off even if your in most of the movie. Being Director is more satisfying because you make a lot of decisions that an actor cannot do. But it can be a nightmare. It seems to me that the really fruitful collaborations between actor and director happen if they have the same passion but not the same vision. I read that you and Scorcese come from the same neighborhood but didn't know eachother very well. Robert De Niro: We have a very sympathetic working relationship. We don't hang out together, but have great working relationship. He might be doing the movie for his reasons and me for mine. He has religious overtones, I'm not thinking in that direction.We do I think complement each other. He's very responsive to any kind of idea. If it doesn't work out he directs you in another direction towards compromise. This makes me think of working with Michael Man on "Heat". It seems you do your best work when you work with somebody who is professional in all areas. Robert De Niro: Michael Man really cares about what he's doing. There's a certain intensity to what he's doing. He creates that through the rehearsal process, so you get a sense that this is going to be special. In the case of Heat, we did all this training with guys who know how to do this - the heast and all that. You could probably rob a bank now? We shouldn't forget the comedies. You had enormous success in recent years with those. How do you feel about doing comedy? Robert De Niro: I enjoy it. They are fun to do. Because they are not serious you can try things you normally wouldn't do from my sense. In that sense, its' fun. Even the big set pieces - that's fun too. It may be a relief. They're not that easy, you gotta think about what you're doing.